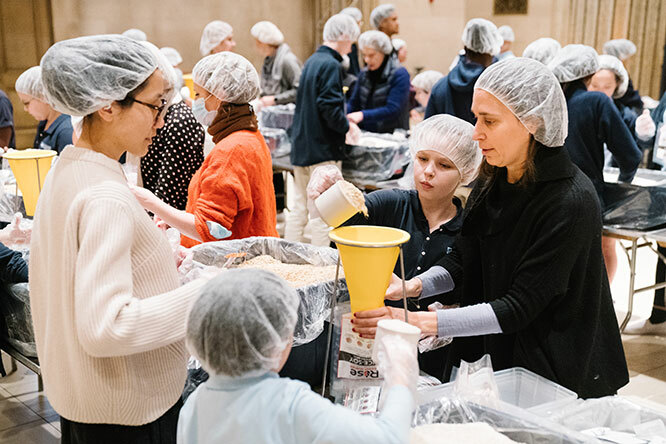 Students at Léman Manhattan Prep, an independent school in the Financial District, recently set themselves a lofty goal: packing 27,000 meals for hungry and homeless recipients in just two hours. On March 6, in the space of just 120 minutes, a team of more than 100 students gathered together to pack life-saving meals. The foodstuffs will be distributed by Rise Against Hunger, a global network that provides food and life-changing aid to the world’s most vulnerable populations, with the aim of ending hunger by 2030. The March 6 event brought Léman’s cumulative total to more than 100,000 meals packed and donated in the past four years. Each year, Rise Against Hunger mobilizes more than 350,000 volunteers to bundle meals for the poor and undernourished around the globe. Since 2005, the organization has distributed more than 315,000,000 meals to recipients in 74 countries. 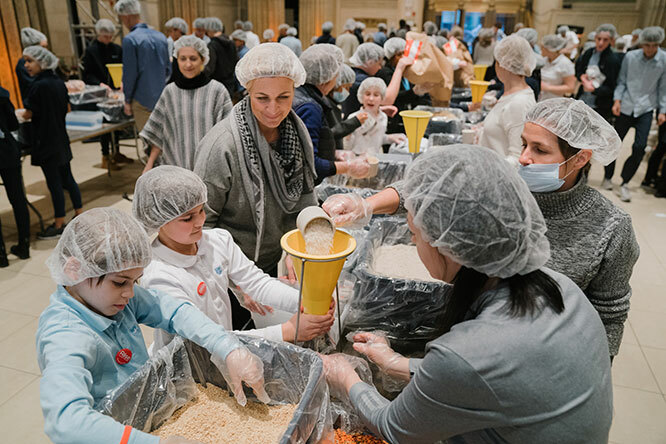 Léman’s partnership with Rise Against Hunger is focused on an assembly line process that combines rice, soy, and dehydrated vegetables, along with a micronutrient flavoring mix formulated by the Kraft Heinz Company Foundation, which includes 23 essential vitamins and minerals. The cost of each meal is less than 35 cents, and the food has a shelf-life of two years. More than 70 percent of the meals prepared by Rise Against Hunger’s collaboration with partners like Léman goes to support transformational development programs such as school lunch programs, vocational training programs, early childhood development programs, orphanages, and medical clinics. With nearly 900 students ranging from 16 months old to grade 12, Léman Manhattan Prep is New York City’s only boarding program, and aims to turn out graduates who are engaged global citizens and confident leaders. As an International Baccalaureate School (comprised of students representing more than 50 nationalities), Léman provides pupils with local and global service opportunities throughout the year.